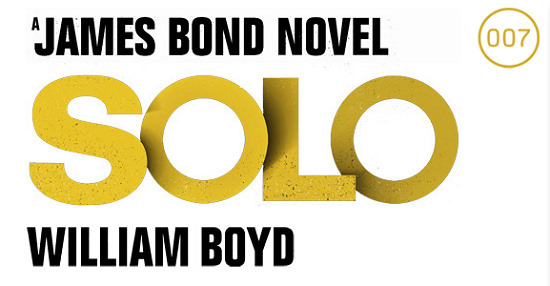 MI6 reports from The London Book Fair, where William Boyd, author of the new Bond continuation novel 'Solo', was 'author of the day' and was interviewed by Erica Wagner, Literary Editor of The Times. Click here to read the press release from Ian Fleming Publications on the announcement of the new title. 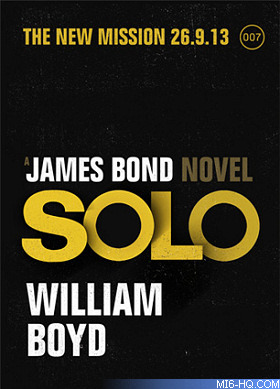 Above: William Boyd announces Solo as the name of new James Bond Book at London Book Fair. 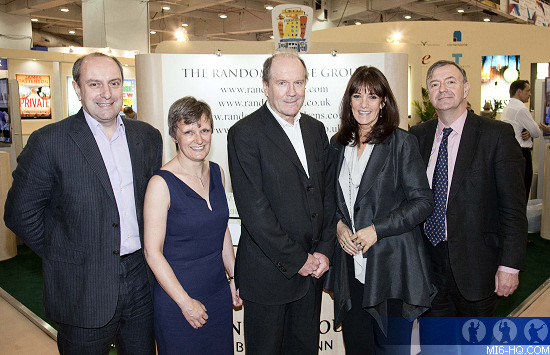 Left to right: Richard Cable (MD, Vintage Publishing); Corinne Turner (MD, IFPL), William Boyd (James Bond Author), Gail Rebuck (CEO Random House Group) Simon Littlewood (Intl. Director, Random House Group). Photo Credit by Luke Sprague. Q: I was wondering if you could give us an indication of what countries Bond is going to visit? WB - I'm allowed to give you, not countries but continents. The three continents he visits in the course of the novel are Europe, obviously, Africa (surprise, surprise), and the USA. So, that's where his journey takes him. I've written a couple of paragraphs explaining why the title is "Solo" and, I can say that it's what happens to him in Africa that takes him off to the USA. There are consequences! Q - I wonder if you could comment on the genre, writing a spy novel, and whether or not you feel you have made James Bond more literary. WB - Well, I don't think the division is that simple. I think there's good writing and bad writing. I think you can very easily distinguish between good writing and bad writing with a simple test: Just look at the number of stereotypes employed. Stereotypes of plots, stereotypes of characters, stereotypes of language; the more stereotypes there are, the worse the book. That's my touchstone for evaluation. So, if you write well - and it doesn't mean you have to write in a stylish way, but if you write well, and your characters are real, and your plots are ingenious, then I don't see the distinction between literary fiction and genre fiction. Raymond Chandler is a superb writer of novels, John le Care is a very important contemporary novelist, but he happens to write spy novels and Chandler wrote detective novels. I think that if the writing is good then the genre is irrelevant. Many, many so called "literary" novelists have written a spy novel, me included - I've written two - Ian McEwan has written two, John Banville has written a spy novel. Joseph Conrad wrote two, Graham Greene wrote several. There's absolutely no reason why, if you think of yourself as a literary novelist, you shouldn't venture into a genre - just write as well as you can. Q - On the subject of genre, you have a very broad range…I just wondered if you were going to treat us to a horror story and a science fiction story. WB - Absolutely not! This is my twelfth novel and I realise, when I look back at my fiction, I can see that there are two patterns of triptychs, I wrote "New Confessions", "Nat Tate", and "Any Human Heart", which are all attempts to push fiction into the bounds of reality and to blur that boarder. And when I look back at the novels "Restless", "Ordinary Thunderstorms", and "Waiting for Sunrise" and I see those as three genre novels, if you like. "Restless" is a spy novel, "Ordinary Thunderstorms" is a kind of contemporary thriller, and "Waiting for Sunrise" is, I suppose, a kind of Buchan-esque adventure. I didn't plan to do that, but, looking back, I see they form a kind of trilogy. My next novel is going to be unlike anything I've ever written before. I have to keep myself interested, and feel that I have written my spy novels and my thrillers, and I've really enjoyed doing them, but my plans for my next novel are completely different. So, I'm not ticking the boxes. Again, I don't like fantasy, I would never write a horror novel, and whilst science fiction is something I enjoy, I would never take it on. So, exercising my muscles in those three novels represent my visits to the genre. Q - Are you showing Bond in middle age in "Solo" and, if so, how does that manifest itself? Also, is there any way a future author can bring him back and make him younger after you portray him at forty-five? WB - Well, define middle age! I mean, Daniel Craig is forty-five years old and he's in great shape! So, I think (Bond) is "mature", let's say. But it's interesting to contemplate Bond ageing. He's not stuck in one age or time zone. EW - Which he is in the films. WB - Yes, he's eternally late thirties, early forties, I suppose. But it's interesting to think of because you can document his life - you know where he was born, you know when his parents died, you know where he went to school, when he joined the Navy - there is a biography of Bon which is there, but there's no reason you couldn't go back a write a novel set in 1955. You don't have to follow chronologically. Fleming was fifty-six when he died - which seems an absurdly young age - but if he'd looked after himself a bit better, he might have been alive in 1969 and could have written a Bond novel then. For me it was more a question of being in the Bond era, it was more to be in the world that Fleming created. I could have chosen any year, I suppose. Y'know, I was thinking: "The Suez Crisis. What was Bond doing then?" Conceivably, you could write a novel going back and picking up Bond at that period. But then you'd have to fit in with the Fleming biography - how old was he, what had happened to him in his life, etc etc. It's an intriguing speculation, but I don't think my novel being set in '69 preempts anything. You can do anything you want, in a way. Many thanks to Ben Williams, Ian Fleming Publications and Colman Getty.